Flex your imaginary bank balance by showing off your muscle in the form of the Declasse Sabre Turbo Custom, available from Benny’s Original Motor Works from April 19. If you like GTA V’s freeform destruction, feast your eyes on our list of PC’s best sandbox games. To celebrate the launch of this new motor, Sabre Week will run until April 21, offering various discounts and bonuses. I know, I know – that isn’t a week. Look, I don’t make the rules, this came straight from Rockstar, okay? For this ‘week’, you’ll be entitled to 20% off all properties, including garages; 50% off tattoos and hairsyles; 25% off select Lowriders clothing; free mechanics services, and more. 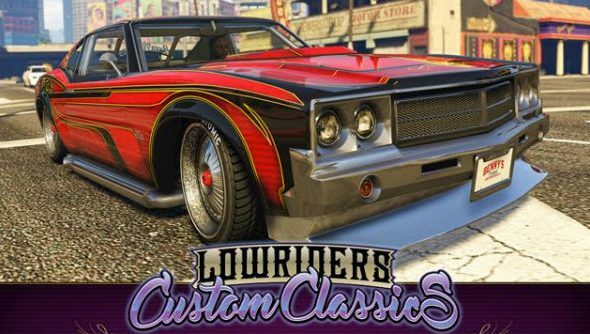 Double RP playlists will also be available, with Lowriders Street Racing offering double between April 18-19 and with Mixed Road Racing giving you twice as much from April 20-21. These bonuses are also available outside of the racing playlists, with Impromptu Races yielding twice the RP for anyone wanting to challenge other Freemode drivers. Additionally, if you ride with friends or other players, you’ll rack up double RP for your digital road trips. Bonuses are also available on the in-game microtransactions, and you can find the full details over at Rockstar’s site.